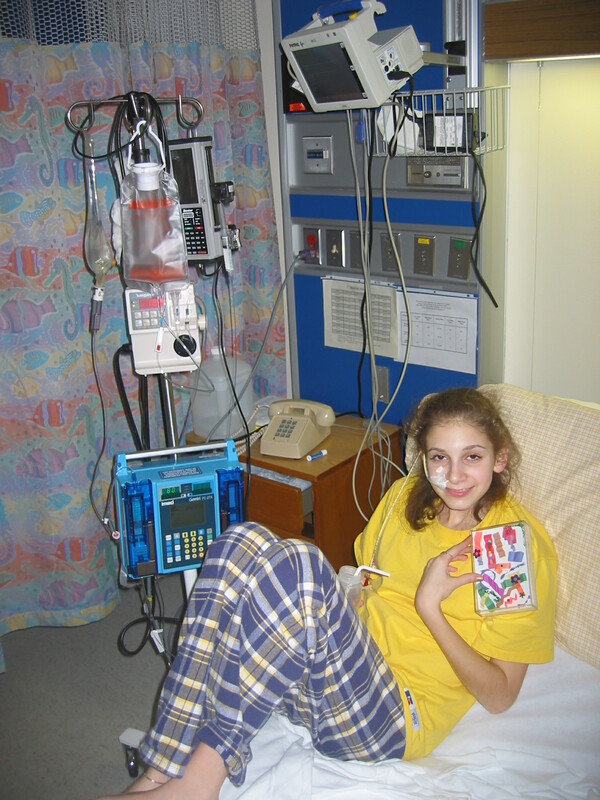 February 2004, Children’s National Medical Center. It wasn’t pretty when it happened, but it got their attention. What came out shouldn’t look “like that” – get her to the hospital right away. They called it the worst case of Crohn’s they’d seen. The adventure begins for this special kid. They brought me back, on a road paved with tests on what they took out of me and medicine and nutrition they put into me. It was at the hospital that I began to understand the challenges of living with Crohn’s Disease—the frequent blood tests, the urgency to use the bathroom, the doctor’s appointments, the volume of pills and maintaining an extremely limited diet. These were soon to become what would be the new normal for me. Oh, and then there was the part when they said that I could no longer run or dance. I’m sorry, that just won’t do. There it is: My new mantra. I picked up where I left off, with an IV in my arm, visiting other kids to let them know they would make it just like I did, and I didn’t look back. Less than six months later, I voluntarily spent my summer with Hindi, a 12-year-old girl from Jerusalem who came to the National Institutes of Health in Bethesda, Maryland for a kidney transplant. Hindi was accompanied only by her father who couldn’t stay with her for religious reasons. Neither spoke a word of English, but I was fluent in Hebrew and hospital. I sat daily with Hindi, talking, playing games and serving as her communicator with her doctors. This girl was a mirror – I looked at Hindi and saw myself. I knew that I too had been in a similar hospital bed. I knew that Hindi, like me with a positive attitude and a commitment to taking care of herself, could overcome her disease and (hopefully) live a healthy life (she is). Some might say I’m compulsive, about my diet, about taking my meds, about being positive. Maybe, but it got me through college and several trips abroad (along with prearranging medical contacts, of course). Convenient? No. But this isn’t about convenience, it’s about adjusting your lifestyle and turning the disease on its head so that it empowers you to go to Capitol Hill, to lobby Congressmen to support Crohn’s and Colitis legislation. People DO listen. It can empower you to be a role model for kids with IBD by being a counselor at a camp like Camp Oasis, a CCFA-funded week-long sleep-away camp for children with IBD that gives them the medical attention they need while allowing them to be “normal” kids at summer camp. It’s a volunteer job, but don’t let it fool you – the payback from those kids is worth far more than any other compensation. To them, I was living proof that despite their disease, they can still attend college, can have hobbies, can travel and can work to improve the lives of others. Oh, and about that message I got about no more dancing? I rejoined my high school Israeli dance troupe after I bounced back (with approval from my doctors, of course), went on to lead my college troupe, and then formed my own for junior high kids. And the message about no more running? This past Spring I trained with Team Challenge and completed my second half-marathon, raising $12,500 through fundraisers on behalf of CCFA. Why did I do it? I ran in honor of my Oasis campers—their resilience and determination continues to inspire me in my fight against Crohn’s. I ran in the hope that medical science will bring new treatments and that the elusive cure will be found. I ran to break the silence that embodies IBD and because I’ve been blessed with good health for seven years and the time has come for me to use that gift in a way to help others. I crossed the finish line in Virginia, joyous. I realized that I’d gone above and beyond—I had successfully run a half marathon in spite of my Crohn’s Disease. When reflecting on my journey so far with Crohn’s, I am extremely proud of where it has taken me, to the people I’ve met who inspired me. As a result, I’m working towards becoming a leader in global health to improve the quality of life for those less fortunate worldwide. Living with Crohn’s may be a challenge, but if you take care of yourself and listen to your body, it won’t hold you down. It’s true: Having IBD does turn you from ordinary to special. But it’s up to you to show everyone just how special you can be. Your story is so inspiring! Thank you for telling it. Just discovered your blog, and look forward to reading it. I’m a lame-o for having not seen your reply earlier… So sorry! Email is on its way! What an amazing story! Thanks for sharing. I’m so glad you are the amazing dancer that you are and are helping many other people to love dancing like you do. Hi Marina – Rena Strauss sent me your information. My 8 year old daughter has Crohns disease. She is going to Camp Oasis for the first time tomorrow. I would love to speak with you! Email me (marninac@gmail.com) with your phone number and I will give you a call. I would love to speak with you! We found the nutritionist at Children’s Hospital in DC to be very helpful in giving us a basic guideline for what foods to start out eating (I was then told that I could slowly reintroduce foods into my diet as long as I felt okay after eating them). Have your son’s doctors said anything about diet and what foods he should avoid? Is he currently symptomatic? These are all factors that contribute to what he should be eating. I have a lot of suggestions, but don’t want to write extensively here. Send me an email (marninac@gmail.com) and I will try be to more specific. I was only 15 at the time and don’t really remember what resources my mother used (she was the one who turned over the house after I was diagnosed to make sure that everything was “Marnina-friendly.” I can ask to see if she has any valuable input as well. It is cool to know that other people are in the same situation with Crohn’s and that I’m not alone. I’ve never met/talked to anyone else with it. I’m doing my master’s in nutrition at Tufts too. Maybe we can all meet up.